It is a common misconception that if you list in the fall/winter, you will most likely receive lower offers and have to wait longer for the right offer. That mindset often keeps people from listing their home, but it all comes down to supply vs. demand. During the holiday season the inventory is lower, yet the demand remains very strong in our market. We don’t have a harsh winter like northern states that would make it less desirable to move anywhere outside of your warm living room. Often buyers are renting and have a lease that is coming up at the end of the year. This gives you a huge pool of potential buyers making the switch from renting to becoming homeowners. Also the competition for homes similar to your is lower and therefor will allow you to command top dollar by not having to adjust to new homes near you on the market. Your home will typically sell faster and for a higher amount because the supply is low and the demand is high for homes just like yours! I know it might not be the most fun thing to do, but it could earn you more profit and you might have fewer hassles as a result. Give it some thought and if you would like to chat about the value of your home in the current market or why now might be the right time, I would be happy to speak with your in detail. 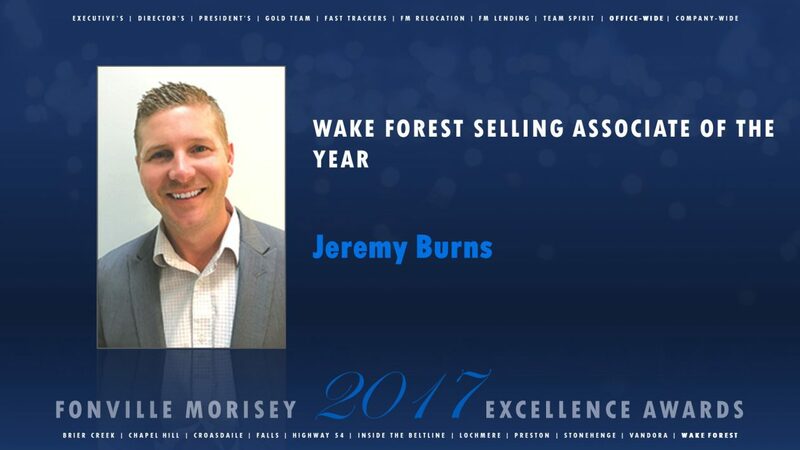 Contact me today at 919-264-5908 or jburns@fmrealty.com. I have several qualified buyer clients that are frustrated with the lack of inventory. Your home might be just what they are looking for. If the home is not priced correctly, nothing else will matter. Thank you to all of my clients for making this possible. I am very honored to receive these awards, but I know it doesn’t happen without your trust! Check out this very helpful information for sellers.